I've been scoping out different options for my bridesmaids - even though I still haven't officially asked each of them yet...still working on that. I shot myself in the foot by deciding to do something special in asking each one...and I'm struggling to get it all finished... but more on that later. 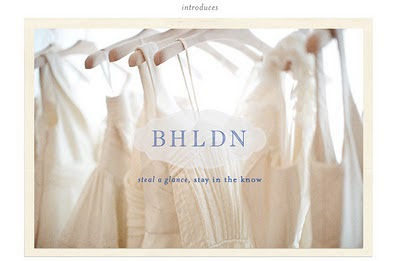 And you also know I'm a huge fan of Anthropologie - so I'm excited and anxious for their new bridal boutique (bhldn.com) that launches Feb. 14th. I'm hoping for dressier options of their amazing dresses for bridesmaid dresses - and fingers crossed for navy! I've also been on the hunt for the perfect rehearsal dinner dress... something cute and casual, so I've been eying some Lilly and Anthro of course, along with some other sites...but how about this gorgeous, not quite a rehearsal dinner dress spotted on Mila Kunis at the SAG awards last night?? One can dream. I'm still struggling to fight an annoying cold that hopefully (fingers crossed) will eventually go away this week. I've got lots to do this week at work and at home... plus a puppy to help look after. My preggers sister is due Feb. 8th - so it could literally be any day that I get the phone call that my niece is making her entrance into the world...I'll have to hop in my car and start making the trek to Atlanta. Monday is almost over...hooray. Here's to a productive and "positive thought" filled week! Cheers! Wouldn't it be lovely to have Lilly bridesmaid dresses?! sigh. We ended up with Lela Rose last year...in a bold cobalt :) Crossing fingers for you that the Anthro opening goes your way...I'm so jealous that I didn't have them as an option when I was getting married! If you haven't discovered Rent The Runway yet, you need to go there for your rehearsal dinner dress...you could get something like Mila wears for a fraction of the cost! I love the Lilly dresses too!! I wish they were more affordable! Sometimes I think her prices are a tad ridiculous!!! My BFF is OBSESSED with Lilly and was thinking about putting the bridesmaids in Lilly dresses, too, but decided it may look too casual. We wound up getting pink flirty dresses made by a designer in Charleston named Sarah Acker (Sarah Maxwell Designs) and the guys wore Lilly bowties. Take a look at this post for more details if you'd like.. The Lilly dresses are cute. I am thinking of getting one of those to wear to weddings this spring. Oh wow. That dress is gorgeous! Hey! I was fortunate enough to be awarded the Sylish Blogger Award, and I would like to pass it on to you! You can get the details on my blog! Congrats! I absolutely love the idea of Lilly-themed bridesmaid dresses! The navy with silver or gold would be perfect! Good luck with all your wedding planning!